Verve Coffee Roasters occupies a large space in the northern end of downtown Santa Cruz, a block west of the San Lorenzo River. Lying between Pacific Avenue and Front Street and close to their junction, there are doors opening onto each street. These are on the left-hand (Front Street) and right-hand (Pacific Avenue) sides, towards the front of the store. This, by the way, is slightly narrower than the back due to the steady convergence of the streets. Both sides have a pair of glass double doors, flanked by tall, narrow windows, with a further window running almost the full length of the wall. These are maybe three-quarters high (and the ceilings are very high) giving Verve an immense feeling of light and space, the sense of space helped by a reluctance to cram too much in. The counter occupies the back half of the store, effectively an ‘n’ shape projecting from the back wall with space on either side for seating. Meanwhile, the area in front of the counter is kept clear, with clean lines from both doors. Entering from Pacific Avenue, where there are benches out on the broad pavement of the semi-pedestrianised street, there’s a two-person window-bar to the right, followed by a much longer window-bar running all the way to the back of the store. Meanwhile, a solitary chair occupies the window to the left of the door, with some padded benches against the front wall, the rest of which is taken up by the retail shelves. The bulk of the seating is off to the right, where a long, communal table sits between the counter and the window-bar. There are also some tables against the back wall. Entering from Front Street, the layout is similar, but with less seating. There’s another solitary to chair, this time to the right of the door, while to the left, there’s a two-person window-bar, followed by a much longer one. Here the back wall is kept clear, but there is a five-person bar along the left-hand side of the counter, which is where you’ll find three Modbar modules. You get a great view of the baristas making pour-over here, and you also get a great view of the twin Kees van der Westen Spirit espresso machines which occupy symmetric positions at the front of the counter. Finally, down the counter’s right-hand side, you’ll find more retail, the cakes and the till, where you order and pay. I ordered the One & One, effectively a split shot, made with the Street Level blend, and served as an espresso and a macchiato. The latter was excellent, the coffee going well with the milk, producing a very smooth drink, with biscuit notes, the coffee distinct enough to impose its flavour through the milk. However, on its own, it was simply awesome, again very smooth, but with a complex taste. Not quite a liquid kiss, but very, very close. December 2018: Verve Coffee Roasters, Pacific Avenue has won the 2018 Best Espresso Award. 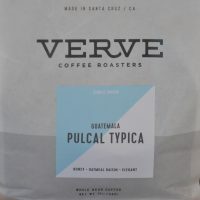 This entry was posted in Cafe/Roaster, Cake, Coffee Shops, Evening Opening, Laptop Friendly, Late Opening, Retailers, Santa Cruz and tagged include, USA2017-01, Verve by Brian Williams. Bookmark the permalink.